I was only a child during the ’90s, but my memory of those times is vivid enough to remember that 8 and 16–bit games were slowly being replaced by CGI heavy releases looking to break the graphical barriers and take gaming to new levels. Back then I was still tackling every game I could get my hands on, and that often meant taking on the occasional pixel-heavy release along the way. When I look back, it doesn’t take long to realise the world of gaming is in a much better place now than it was then; there’s no way you’d find me swapping out my 4K TV or Xbox One X to go back to something with a more retro vibe. The latest game to arrive however is one that’s tried to reignite my enjoyment in those retro classics once more – Xenon Valkyrie+. Things start off with a rather telling cutscene. There’s a sense of urgency in the air and the planet is under threat from a moon that has come out of the shadows thanks to a wicked witch residing deep within. Your job? That’ll be to work your way down to the deepest depths of the moon and put a stop to her, before she unleashes the ultimate hell on our planet and destroys all living people, aliens and robots upon it. ‘Simple’ I said with utter confidence. But it turns out that Xenon Valkyrie+ has other plans, and it doesn’t involve getting even remotely close to the wicked witch of the moon. 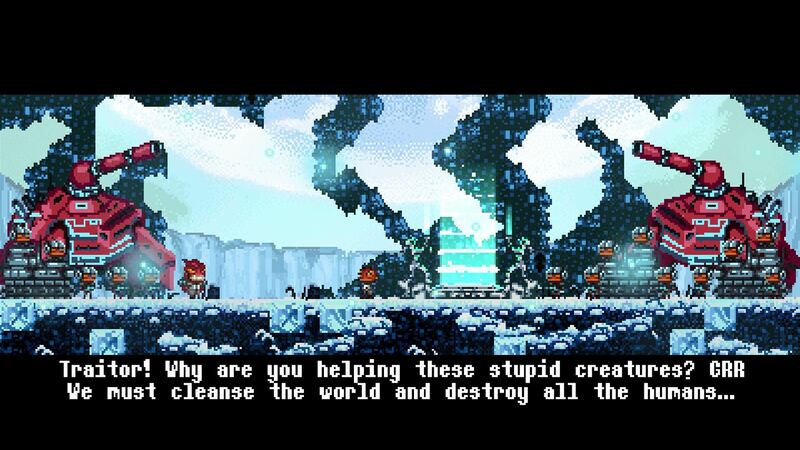 You can blame the unrelenting force of the crushing difficulty found throughout for that. This is a randomly generated rogue-like adventure in which players choose from three playable characters; Renna, Eloen and Nue. Each of the characters begin with a unique loadout containing a sword, a gun, and a number of grenades, along with a special skill that is unique to each one. One of the two girls can use a bomb as her special ability, whilst the other has a radar-like ability which can be used to hunt down the gargantuan enemies within each level. 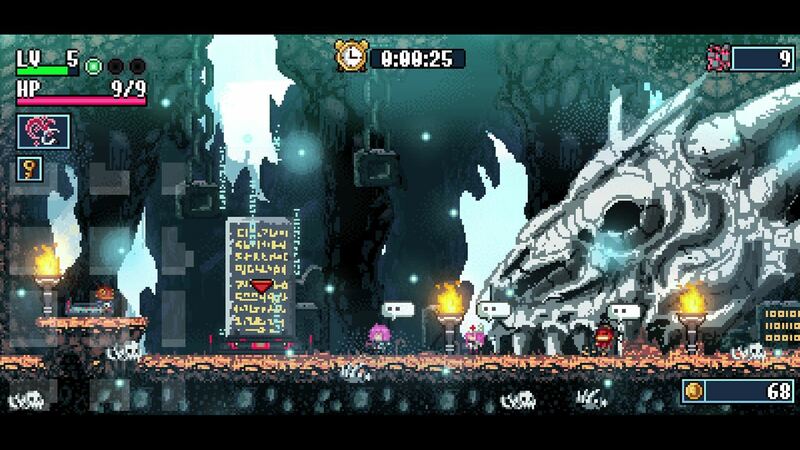 You’ll want to do that too as beating them brings valuable keys that can later be used to unlock chests throughout the run. Nue on the other hand has a super jump skill, and it’s fair to say that it’s by far the best ability of the three characters. As I previously mentioned this is a rogue-like game, and that means you’ll get a random run every time you die, death is permanent and you will be required to start over from scratch. Dying is something you will do a lot thanks to having very little health in the first place. The goal of each level is fairly simple; you start at the top and need to make your way down to the portal somewhere along the bottom. To ensure you’re not wandering aimlessly, there is a map that shows the layout of the level, along with a coloured dot at the bottom which represents the location of the exit portal, and a ton of red dots which represent the huge number of enemies casually strolling along their platforms. The best way to progress through each of the levels is to take it platform by platform, casually working down whilst dispatching each and every enemy along the way. This is time consuming of course, but it does allow the collection of resources such as gold coins and hidden chests that are buried within the platforms of the level. Unfortunately, the top of the screen also houses a rather pressuring timer that showcases just how long you’ve spent on your latest run. I don’t really know why it’s there, there’s certainly no need for it to be there and I couldn’t find a way to turn it off either, but it certainly made me feel like I wasn’t playing the game the way it was intended. You see, each time I’d start up a new run, it was hard to miss just how long I’d taken, and before long I was trying to make my way to the portal at the end of the level without even bothering with most of the enemies along the way. This causes a number of problems in itself, as not only does each level contain a ton of enemies, but given the random generation, and the rather simple map, it’s hard to judge the size of each drop when you fall of a ledge, and it’s impossible to see just what you’ll land on. You’ll find yourself landing on awkwardly placed spikes, or directly on top of enemies and watching your life diminish through no real fault of your own. Between each level, players can briefly relax, as this is where you get the opportunity to spend any gold earned within the levels to stock up on health, ammo and grenades. If you’ve saved enough, there is even the chance to buy permanent starting weapons for new runs. There are also a few different characters that provide some rather dull conversation in these areas, as well as stones full of ancient languages for you to try and decipher. After progressing through enough portals and the rest areas that follow, players will arrive at a boss fight. It needs to be said that those found in Xenon Valkyrie+ are absolutely brutal – expect to be sent packing by these guys countless times. There are also some portals that can be used to skip already cleared areas, but unfortunately you still start off with the useless starter weapons even when using these, so it’s not really a major benefit. 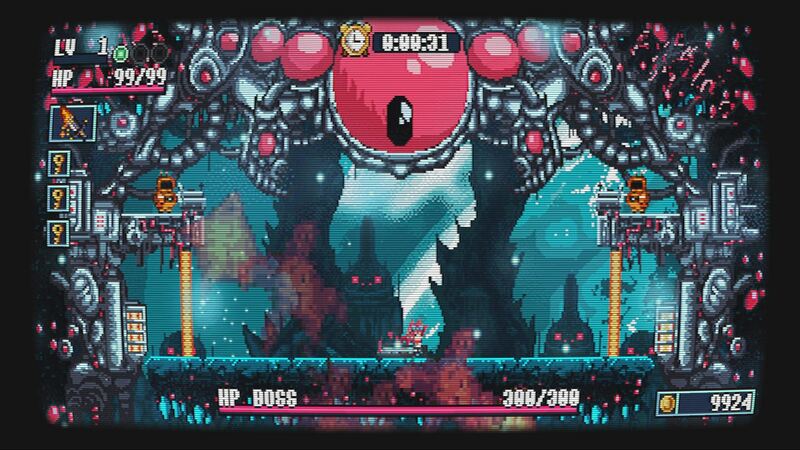 The brutal difficulty of Xenon Valkyrie+ certainly limits your progression, but it isn’t the only thing that fails to inspire, as the art style is disappointing. Whilst the game is randomly generated on every run, I can’t help but feel the 16-bit art style puts a dampener on the unique differences between them. 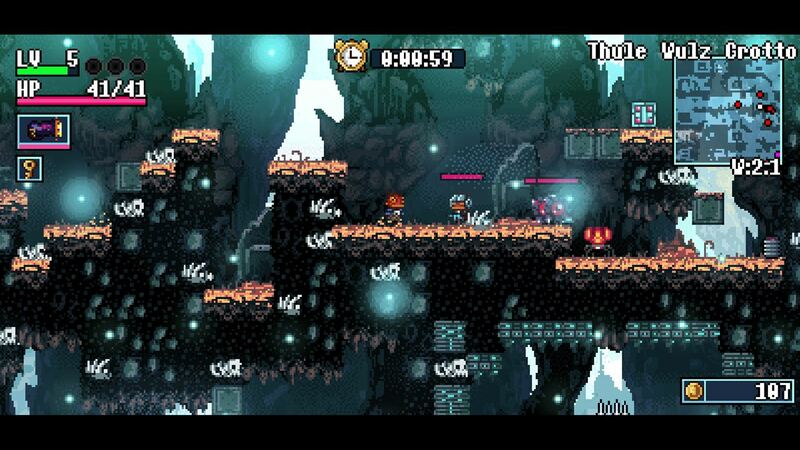 The main change in each level is simply within the layout, the enemy and the chest spawns. Whilst that doesn’t sound unexpected, when every run looks near identical to the last, it doesn’t take long for things to border on that of the repetitive, especially when you’re dying repeatedly. A big part of this is due to the limited colours making everything feel too similar. When enemies and items begin to blend, this is a problem. My biggest issue with the game however is also to do with one of the best features about it – the soundtrack. The soundtrack really does bring Xenon Valkyrie+ to life; it’s loud, it’s upbeat and it’s in your face. When you’re taking the game slowly though, the non-stop pounding techno beat blaring through your headphones is more than enough to cause a headache. Fortunately, this can be turned down and even off – something which I chose to do on a couple of occasions – and if you want to get through the first few levels without feeling like there’s a rave coming through your speakers, then you’ll need to do this early on. The reason why it comes across as so powerful though is once again down to the disappointing visuals. There is only a certain amount that can be done with a 16-bit art style, and you’ll be hard pushed to find a way to fit such an expressive soundtrack with it, especially when the general tone of the game being so dark. For me, the soundtrack and art styles found in Xenon are a complete mismatch. If you’re a fan of rogue-like adventures, then there is every chance that Xenon Valkyrie+ will have something for you to enjoy. If you like speed running, then there’s even more chance that you’ll find that the game is worth a shot. But that said, if you want a bit of flair, a bit of style and a bit of action, then you’re probably better off looking elsewhere as Xenon Valkyrie+ can’t help you. It’s dated, it’s overly difficult and it lacks that something special to make it more than your typical rogue-like experience.